So you have a really nifty fishing kayak that you love taking out on the water. It’s an amazing feeling – just you, the little bit of fiberglass or plastic that makes up your boat, and the open water. You may have modded your kayak to make it your own, too. Maybe there is a trolling motor, or multiple fishing rod holders. Now the only thing left to install is a fish finder. Mounting a transducer in a kayak is incredibly easy – easier than on an actual boat! You are in luck! There are four ways you can mount a transducer in your kayak – in the hull, through the scupper hole, on the back near the rudder, or using a portable kit with a suction cup transducer. Some people like to “dangle” a regular transducer over the side, but this greatly reduces the life of your equipment. The bright side is that you don’t even need a separate transducer. 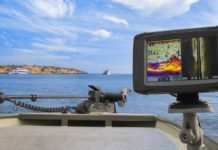 Provided you install it correctly, even a normal transom-mount “skimmer” transducer should do the trick and shoot right through the plastic to give you a good reading. The only thing that will be sacrificed is the temperature reading. 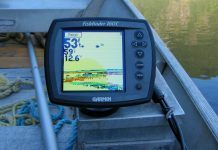 Once you have decided on a method of installation, check out our favorites for fish finders you can install in kayaks. This is the method that most people seem to prefer. Most forums and youtube videos also show this same way of mounting. Open the hatch of your kayak and choose a good, flat spot on your hull as a location for your transducer. If your kayak doesn’t have any way of direct access to the hull, you should consider one of the other mounting methods. Clean the spot using rubbing alcohol. Make sure there is no dust, grime, or debris where you will mount. Now we have to stick the transducer. Some people like to make a “housing” for the transducer to make it more secure. To do this, you can use a pool noodle(available at almost all Wal-marts and Targets). Make a 2-3 inch thick slice of the pool noodle, and using a sharpie, trace the shape of the transducer on the center. Use a serrated knife to cut out the shape of the transducer, and fit it in the cut-out snugly. Apply marine goop(or silicon) in the size of your transducer and housing to the area in the hull that you cleaned with alcohol. Apply generously, and make sure that there are NO AIR BUBBLES trapped in the goop. Any air bubbles will SEVERELY COMPROMISE the readings. Apply a piece of duct tape to the top of the transducer and housing – this is to keep it secure on the inside of the hull as the goop dries. Place the transducer on the goop, nice and secure, and tape it down with the duct tape. Once it’s a little dry, you can remove the tape. You can also apply a little bit of marine goop on top of the transducer, too. Wait at least 24-48 hours till dry. 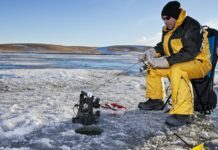 Run the cable up through a hole(you can also drill one, but position it close to where you mount the fish finder) and use a watertight fitting to bring the wire out. Bring out just enough so the wire can plug into the fish finder unit perfectly. NOTE – You can install a transducer using this very method without making any housing for it as well. I think this is just a matter of personal preference – having a housing gives an extra sense of security, so if you are more comfortable with that, great! This is a really innovative method. The only drawback here is that your one of your scupper holes will get plugged up, so you will need to find another way to drain the water from your kayak! 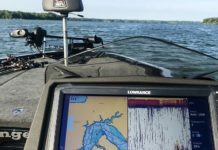 If you are not in the mood for a DIY project, Lowrance makes a scupper mount that you can just fit a transducer on and stick through the scupper hole. 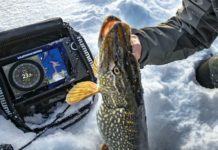 Even though they say it’s only meant for Lowrance transducers, with a little creativity, you can even fit a Garmin or Humminbird transducer as well. Fit the transducer in the cut-off area, making sure you have already run the wire through the pipe and that it’s sticking out of the top, and screw the transducer in through the holes you made. Stick the pipe through the scupper hole, making sure the transducer sticks out at least one inch below the bottom of the kayak. Seal the top of the pipe using a cap – this will work fine even when the wire is sticking out from beneath the seal. You have yourself a makeshift transom! Mount the transducer on the plate, but make sure it’s a little higher that the rudder or the bottom of the kayak. This way, if you hit a rock, the bottom will hit and not the transducer. It’s that easy! 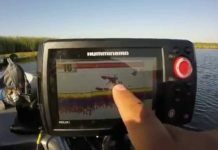 Run the wire across the top of your kayak to wherever you want to mount the fish finder. Make sure you secure the cables down with clamps or twist-ties. This method is probably the most convenient. It may be a little less cost-effective because the portable kits are a little more expensive than the normal ones. The kits come with a battery, and you can secure them using the bungee cords on your kayak. 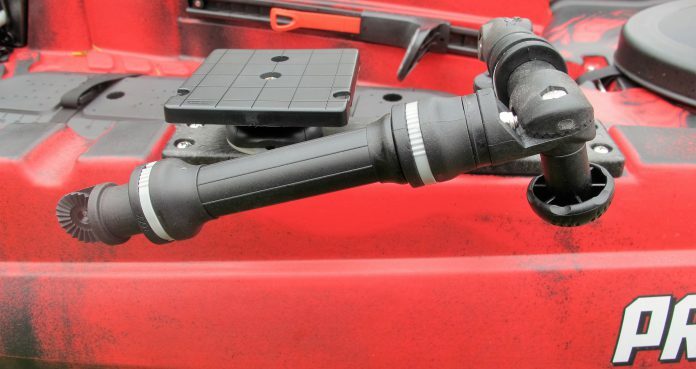 The transducer mounts wherever you want it to using the suction cup. Once you are done, pull it out of the water, back in the bag, and you are done!